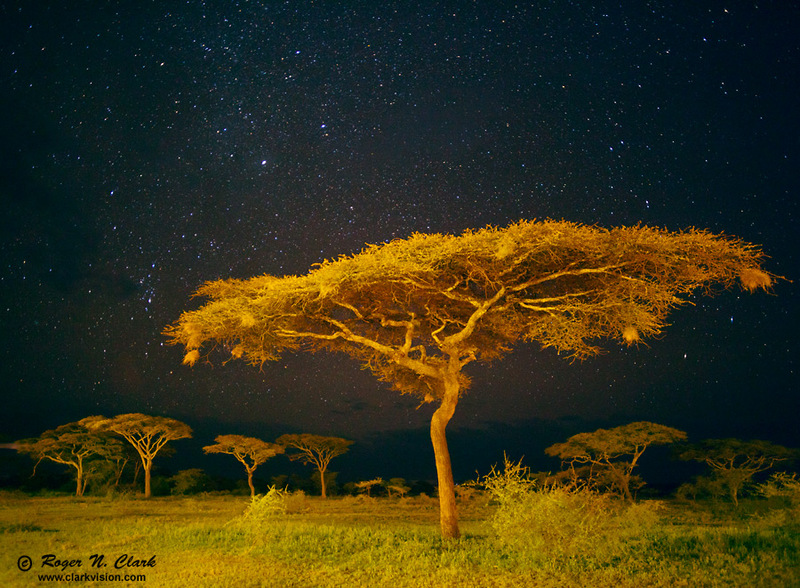 Night on the Serengeti is as magical as are the days. The stars appear bright with no cities to contaminate the sky with light pollution. These acacia trees were lit by the orange glow of incandescent lights from nearby cabins, while lions roared in the distance. The view is looking north toward the central Serengeti (the North Celestial Pole is about 2 degrees below the horizon). Clouds block some of the sky. Technical. Canon EOS 5D Mark II 21 megapixel camera, 20 mm f/2.8 lens, 30 second exposure on tripod at f/2.8, ISO 3200.